The House committee on security said it has evidence showing transnational human traffickers are behind the influx of Rohingya boat people. The House committee chairman, Jehraming Tohtayong, said his committee has discovered that networks of transnational human traffickers have been involved in scams to bring Rohingya people into Thai soil before taking them to the third country. Some of those transnational human traffickers also operated from Thailand, said Mr Jehraming. Mr Jehraming said the House committee visited on Saturday 78 Rohingya people recently rounded up in Phangnga and detained in Ranong. Police found those Rohingya migrants brought with them telephone numbers of presumably their fellow Rohingya people that have already settled in Thailand, particularly Ranong and Nakhon Ratchasima province. According to Mr Jehraming, the Thai government would consult Asean member countries in the coming Asean summit late this month on the Rohingya problems. The committee viewed the problems must be addressed at the rooted causes by affecting countries including Malaysia, Indonesia and Bangladesh. The Thai government should encourage the United Nations High Commission for Refugees (UNHCR) to take action by looking after the Rohingyas' living conditions as well as making sure their human rights are well protected at their homeland in Burma, said Mr Jehraming. The committee also wanted the government to come up with a national strategy for Rohingya issues with a clear operation plan on the issue for state authorities. More importantly, law enforcement officers should take action against human trafficking networks in Thailand. For those that did not see the headlines, the NY Times reported on Tuesday that about 200 Rohingya refugees from Burma had been rescued at sea after the Thai government forced them to leave Thailand by rounding them up and sending them out to sea on a boat. About 850 Rohingya have been rescued in the last month. Three boats were discovered by Indian authorities and another was found near Thailand. The other three boats are still missing. The United Nations calculates that about 723,000 Rohingya live in Myanmar. Rohingya are officially considered foreigners in predominantly Buddhist Myanmar and are not entitled to own land or hold passports. Jonathan Head reporting for the BBC News in Bangkok wrote about the unrelenting discrimination faced by Rohingya minorities all over the region. So what is it that is driving so many Rohingya, a Muslim minority from the western-most part of Burma, to flee in rickety boats in the hope of finding refuge elsewhere? The term Rohingya refers to a distinct, Muslim ethnic group living in northern Rakhine state, along the border with Bangladesh. They are thought to be descended from Arab and other Muslim traders who travelled and settled there more than 1,000 years ago. They speak a dialect of Bengali similar to that spoken in the Cox's Bazaar region of Bangladesh. There are perhaps one million living there, but may be as many more living overseas, mainly in Bangladesh, Saudi Arabia and Malaysia. Northern Rakhine state is one of the poorest and most isolated in Burma. But the burdens imposed on the Rohingya by Burma's military rulers make their situation a whole lot worse than other people living in the area. "Economic hardship and chronic poverty prevents many thousands of people in north Rakhine state from gaining food security," says Chris Kaye, the country director for the UN's World Food Programme who visited there two months ago. "Many do not have land rights or access to farmland to grow food, and the restrictions and limitations on the movement of people, goods and commodities places additional stress on people's livelihood opportunities." For a start, the Rohingya are denied citizenship under Burma's 1982 citizenship law, which leaves them out of the 135 ethnic groups officially recognised by the state. The official view of the Burmese military is that they are illegal immigrants from Bangladesh or their descendants. 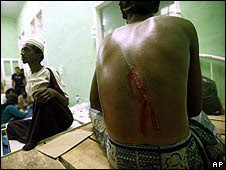 Rohingya trying to leave Burma are often harassed and beaten by the Burmese security forces, but then allowed to leave, and told never to return. They are also unable to travel freely. The military demands that they obtain an official permit even to travel to the next town. It is almost impossible for them to get permission to travel outside northern Rakhine. Rohingya are subjected to routine forced labour. The amount of time they have to give varies, but Chris Lewa at the Arakan Project says that typically a Rohingya man will have to give up one day a week to work on military or government projects, and one night for sentry duty. This reduces the time they have to earn a living for their families. Burmese Buddhists living in the area are usually not required to do this. The Rohingya have also lost a lot of arable land, which has been confiscated by the military to give to Buddhist settlers from elsewhere in Burma. One of the most bizarre forms of discrimination imposed on the Rohingya is that they must get official permission to get married. Like all the other documents they must obtain, these give opportunities for officials to extort money from them, and the marriage approval can take two years or more. Couples caught getting married or sleeping together without this approval can be arrested. The Arakan Project has documented a number of cases where the men have been jailed, in one case for seven years. When they get married they are required to sign a commitment not to have more than two children. This litany of abuse and harassment makes the Rohingya a downtrodden underclass even in Burma, one of the world's most repressive and impoverished states. This is why 200,000 fled to Bangladesh in 1978, and another 250,000 between 1991 and 1992. There has been a steady stream into Bangladesh since then. But the numbers heading out into the Andaman Sea by boat have increased sharply over the past two to three years. There has been no discernable deterioration in the way the Rohingya are being treated by the Burmese authorities, as in 1978 and 1991, so other factors are driving them to leave. Conditions for the Rohingya in Bangladesh are grim. Around 28,000 live in the two officially recognised camps, which get some assistance from the UN. But 200,000 more eke out an existence outside the camps, in a desperately poor part of Bangladesh, with no official documentation, and no prospect of employment. In the past they have made their way to the Middle East, especially Saudi Arabia, in search of work, as many Bangladeshis do. They could do that because it was relatively easy to obtain Bangladeshi passports. But heightened security concerns in Bangladesh and Saudi Arabia over Islamic extremism have made it far more difficult for the stateless Rohingya to travel. Instead they have been making their way to Malaysia by boat. There are already around 20,000 Rohingya in Malaysia, and the UN has had some success in protecting them from deportation. The job prospects there are better than Bangladesh, and this slim hope of a better life is what is now driving thousands to take the risky journey across the Andaman Sea. Inevitably some have landed in Thailand instead. Others have been intercepted by the Thai navy once they entered its territorial waters, which lie en route to Malaysia. Networks of brokers have grown to cash in on this hope; they charge up to $800 (£547) to make the trip in rickety and overcrowded boats. Shortages of food and higher prices over the past year in northern Rakhine state are also driving more people to flee. Of the Rohingya survivors being washed up in Indonesia and the Andaman Islands after being set adrift by the Thai security forces, some left Bangladesh, some left Burma, and a few had been rounded up in Thailand after living there for some time. The scandal over Thailand's treatment of the Rohingya has at least brought their plight some rare publicity. It has also brought home to Thailand and Burma's other neighbours that the unending repression inside Burma affects them far more than anyone else, and that the Rohingya are a regional problem which requires a concerted regional response. Whatever horrors they may have endured recently in the Andaman Sea, the flow of Rohingya boat people is unlikely to stop. Whether traffickers are to blame for Rohingya moving in droves across borders, the response currently put forward by the affected governments is hardly productive and puts the refugees at further risk of being retrafficked or killed. Your post explores the overlooked role that human traffickers play in the midst of this chaotic displacement of the Rohingya from Myanmar into neighboring states. Present day repression of the Rohingya minority is only the latest development in the government’s attempt to homogenize in the hopes of strengthening their threatened power. I find that it has been helpful to contextualize this current targeting and abuse of an ethnic minority by taking a look at the government’s consistent history of such behavior in order to gain some insight as to the possible outcomes of this scenario. In the 1990s, faced with several secessionist movements in outlying areas of the country, the Christian Karen group near the country’s border with Thailand has been under siege for decades. The public repression of Buddhist monks last year decidedly reveals that this government will not respond to pressure be it internal or international. Amnesty International has published a letter encouraging increased demands on Myanmar to cease its violent policy towards the Rohingya, but I would argue that this is clearly not the avenue through which consequential action will be engendered. The government views its projects of eradicating “non Burmese” elements as a road to peace and development when in reality they are little more than ethnic cleansing campaigns. The problem becomes more complicated when already impoverished countries like Bangladesh are faced with a massive influx of refugees, placing incredible strains on an economy still recovering from a cyclone that killed 140,000 last spring. Given the complete economic degradation of these states, I would venture to say that the human trafficking element of this story will not be dealt with. However, perhaps the Rohingya will not feel the need to seek the services of such East Asian coyotes if international organizations step in to provide the necessary space and provisions for their survival. Dhaka fears that inviting such help from the UN would threaten diplomatic relations with neighboring Myanmar. Although I believe that Amnesty’s call to respect human rights will fall on the dictatorship’s deaf ears, the call for neighbors who are party to the Land of the Sea Treaty to rescue people fleeing on flimsy rafts is an interesting way to make a potent case for regional involvement. The two hundred plus deaths of refugees forcibly deported from Thailand could not showcase this more clearly. Perhaps if Bangladesh is fearful of alienating its neighbor and trading partner, then perhaps more stable nations like India, Malaysia, and even Thailand, can ask the United Nations for support in order to protect these people not only from their government, but from the risks of fleeing from its oppression as well. Those depraved enough to seek profit from such misery may not be thwarted by moral arguments. It is therefore crucial to ensure that those fleeing from violence are not desperate enough to fall into their hands.